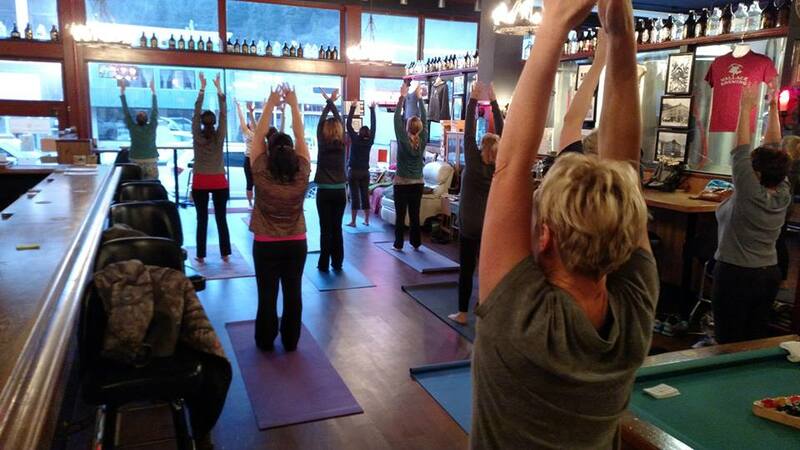 Join us the 3rd Wednesday of each month at 5:30 for a blissful evening of yoga and great beer! Emma Stayduhar from Cornerstone Yoga and Wellness leads a great workout at 5:30 then we relax and rehydrate with a pint of your favorite Wallace Brewing beer at 6:30. If you aren’t a beer drinker, you have some wine options – Black Box Red Blend, Pinot Noir, Chardonnay, Reisling, and Rose. Soft drinks include coffee, hot tea, Pepsi, Diet Pepsi, Coke and Sprite. Beginners are welcome to join us. Wear comfortable clothing and bring your yoga mat. Emma will have loaner mats available if you don’t have one. Plan to arrive a little early so you can stake out your favorite spot. $10 gets you the yoga class and a pint of your favorite WBC beer or glass of wine (or pop or coffee…). As always, you must be 21 to participate.